The last of the United States Coast Guard Utility Boat Large (UTB) has been placed on permanent display in front of the Door County Maritime Museum in Sturgeon Bay. A crew from Bay Shipbuilding lifted the boat into its final resting place along Madison Avenue, where its exterior is being readied to be open to the public and the interior for special events. The 41-foot UTB class vessel has been one of the most successful boats in Coast Guard history, serving as a general workhorse at multi-mission stations for 41 years. In all, 207 UTBs were built at the Coast Guard Yard in Curtis Bay, Maryland, from 1973 to 1978. They have been credited with saving thousands of lives and millions of dollars in property. The CG-41410, which now sits in front of the museum, has the distinction of being the last UTB in service, having been retired in ceremonies held during the Coast Guard Grand Haven Festival last summer. CG-41410 went into service on July 1, 1977 at Station Milwaukee and served at a number of Lake Michigan stations in the succeeding 37 years. That included twice being stationed at the Sturgeon Bay Canal Station from April 26, 2002 until Aug. 15, 2003 and again from June 12, 2007 until Aug. 6, 2007. It was last stationed in Muskegon, Michigan. The boat is back in Sturgeon Bay through a cooperative effort by the USCG Historians Office, USCG Sector Lake Michigan, the Door County Maritime Museum, the City of Sturgeon Bay and the Sturgeon Bay Coast Guard Committee. It arrived in Sturgeon Bay aboard a USCG barge being pushed by the USCGC Mobile Bay from the USCG facility in Milwaukee. 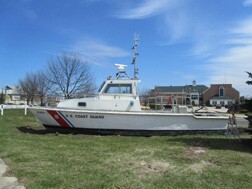 It is on permanent loan free of charge from the national Coast Guard collection. The 41-foot UTB has since been replaced by the 45-foot RB-M built at Ace Marine in Green Bay.